How Many Stan Lee CGC Signature Series Books Exist? Stan Lee will live forever through his incredible creations and stories. He gave so many gifts to comic collectors; and one of those gifts was the way he embraced the CGC Signature Series. CGC first announced the launch of the Signature Series back in May of 2001 as a solution to the problem of how to authenticate an autographed copy of a comic book. The advent of the Signature Series was, in my opinion, brilliant — because prior to its existence the best a collector could do was rely on a Certificate of Authenticity (COA for short) as evidence that the signature on a given comic was authentic and not a forgery; another form of “proof” you would often see offered was a photograph of the creator at the signing. But photographs and COA’s are far from an ideal solution to authenticate an autograph, because even the fanciest/”least-photocopiable” COA’s are still physically separate from the signed comic book itself — therefore making it possible for a forged copy to be “swapped” for the real copy even if the COA itself is original. But what if there was a trusted authority would both (a) witness the signing, and then (b) immediately take the signed comic into their possession and seal it into a tamper-evident plastic holder together with a COA? That way, to the extent the trusted authority has people’s trust, every collector going forward will now be certain the comic in question sealed inside that plastic holder wasn’t swapped with a forgery! And what is the most desirable signature on a CGC Signature Series book? Ask any group of collectors today and the most popular answer is bound to be Stan Lee — and between the advent of the Signature Series in 2001, and November 12, 2018, Stan Lee Signature Series books (and Signature Series books signed by other creators as well) were created in a steady stream. By 2011, CGC announced it had reached 100,000 certified CGC Signature Series books. Each CGC Signature Series book is counted distinctly on CGC’s census — in other words, they come right out and tell us how many CGC SS copies exist out there, for any given census entry for a given issue (or variant of that issue). What they do not tell us on their census, is who signed each Signature Series comic listed. So for the past 17 years worth of accumulated census data, we unfortunately cannot see how many of each issue were signed by Stan Lee specifically — but, we can say with certainty that Stan Lee cannot have signed any more than all of the CGC SS copies on record for any given census entry! Thus, by referring to the CGC census data we can get a good handle on an upper boundary across issues and titles, for how many Stan Lee CGC Signature Series copies there are out there. While that’s not the ideal answer to the question of how many Stan Lee CGC Signature Series books exist, it does still help us by giving us an idea of the absolute maximums. 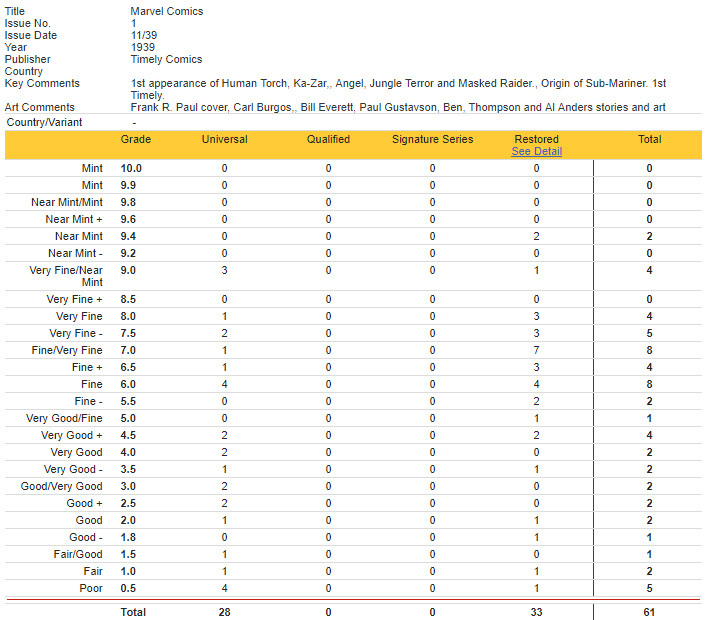 And as it turns out, the at-maximum numbers are not particularly large… Back in August of 2018, prompted by the news that Stan Lee was no longer going to be participating in public signings, I took a look at how many CGC Signature Series books there were across every issue of Amazing Spider-Man, a title that many a Marvel collector would certainly name if asked for their favorite title. I thought given the news, it marked an important snapshot in time to look at the data, because it appeared that there was only going to be a comparable “trickle” of new CGC SS copies carrying Stan Lee’s signature from that point forward, while meanwhile the flow of signed books from other creators would continue to hit the census unabated. Back at that point in time, the answer for the Amazing Spider-Man title was no more than 60,000 Stan Lee Signature Series copies. And doing the same exercise today, as of 11/27/2018, with all of the additional issues added to the census since then plus the stream of CGC Signature Series copies signed by other creators, we now see a maximum Stan Lee CGC SS count for Amazing Spider-Man at 66,838 copies; and if you include all issues with “Amazing Spider-Man” anywhere at all in the title/census name, the maximum count is 68,006 [I made use of Greg Holland’s indispensable research website to assemble the information]. A range of 60,000-68,000 maximum copies of Amazing Spider-Man ever signed by Stan Lee under the Signature Series strikes me as a low number in the scheme of things! Imagine for sake of argument that “Amazing Spider-Man CGC Signature Series” was actually one issue. If we learned it had a print run of 60K that would strike us as a fairly small print run in the context of the average paid circulation numbers for the title (for example in 1970 the average total paid circulation is shown at 322,195 copies; for 1980, 296,712 copies; for 1990, 334,893 copies…). One way to think about Stan Lee Signature Series copies is that Stan Lee was, in effect, the printing press for such copies, but a printing press that was churning out Signature Series copies for these past 17 years instead of a one-time batch. And now, the number of Stan Lee CGC Signature Series copies can no longer increase. Let’s look now beyond the Amazing Spider-Man title, at some other key titles across the Marvel universe — note that I’m not intending what follows to be a comprehensive look at all Marvel / Atlas / Timely titles that Stan Lee may have signed. You won’t find Marvel Comics #1 in the tables (but zero Signature Series copies are on record anyway for that issue). Instead, I have focused on Silver-Age-and-onward Marvel titles that correlate to the major Stan-Lee-created comic book characters that come to mind: Spider-Man, the X-Men, Iron Man, Thor, the Hulk, the Fantastic Four, Black Panther, Daredevil, Doctor Strange, and Ant Man, to list some of the bigger names. If your favorite title (or the one you were looking for) is not listed in the reference guide below, then I’d encourage you to make use of Greg Holland’s research website yourself to research those titles. I believe that using the 11/27/2018 census snapshot for maximum Stan Lee CGC SS counts should be highly conservative given the August news mentioned previously — because since then, Signature Series books from other creators have meanwhile been flowing onto the census unabated — but it is of course still possible that there are some books that were signed by Stan Lee earlier in the year that for one reason or another have not yet left CGC (maybe waiting on CCS services or something of that nature and thus still in the queue months later; but I have to imagine such instances would be relatively very small in number). So with that caveat stated, here’s how to use the tables that follow. Note that each of the tables below presents every unique census entry found where the name of the census entry starts with the name of the title searched for — in this way similarly-named titles such as “Amazing Spider-Man: Renew Your Vows” for example are included in the Amazing Spider-Man table; this search method also automatically includes any Volume 2 issues, any Type 1A cover price variants, any foreign editions, any retailer incentive variants, etc. etc.